Operation Gibraltar was the codename given to the strategy of Pakistan to infiltrate Jammu and Kashmir, and assist the locals in starting a rebellion against Indian occupation. Pakistan specifically chose this name to draw a parallel to the Arab invasion of Spain that was launched from the port of Gibraltar. In August 1965, Pakistan Army's Azad Kashmir Regular Force troops, disguised as locals, entered Jammu and Kashmir from Pakistan with the goal of fomenting an insurgency among Kashmiri Muslims. However, the strategy went away from the outset due to poor coordination, and the infiltrators were soon discovered. The operation sparked the Indo-Pakistani War of 1965, the first major engagement between the two neighbours since the Indo-Pakistani War of 1947. Following the First Kashmir War (1947–1948), which saw India maintaining its hold over two-thirds of Kashmir, Pakistan sought an opportunity to win the remaining Kashmir areas. The opening came after the Sino-Indian War in 1962 after India's war with the China and as a result the Indian Military was undergoing massive changes both in personnel and equipment. During this period, despite being numerically smaller than the Indian Military, Pakistan's armed forces had a qualitative edge in air power and armour over India, which Pakistan sought to utilise before India completed its defence build-up. The Rann of Kutch episode in the summer of 1965, where Indian and Pakistani forces clashed, resulted in some positives for Pakistan. Moreover, in December 1963, the disappearance of a holy relic from the Hazratbal shrine in Srinagar, created turmoil and intense Islamic feeling among Muslims in the valley, which was viewed by Pakistan as ideal for revolt. These factors bolstered the Pakistani command's thinking: that the use of covert methods followed by the threat of an all out war would force a resolution in Kashmir. Assuming that a weakened Indian military would not respond, Pakistan chose to send in "mujahideens" and Pakistan Army regulars into Jammu and Kashmir. The original plan for the operation, codenamed Gibraltar, was prepared as early as the 1950s; however it seemed appropriate to push this plan forward given the scenario. Backed by then foreign minister Zulfiqar Ali Bhutto and others, the aim was an "attack by infiltration" by a specially trained irregular force of some 40,000 men, highly motivated and well armed. It was reasoned that the conflict could be confined only to Kashmir. In the words of retired Pakistani General Akhtar Hussain Malik, the aims were "to defreeze the Kashmir problem, weaken Indian resolve, and bring India to the conference table without provoking general war." As a result, groundwork and intelligence gathering for execution of the plan was laid by launching "Operation Nusrat", the purpose of which was to locate gaps in the Cease Fire Line (CFL) that were to serve as entry points for the mujahideen, and to gauge the response of the Indian army and the local population. Despite initial reservations by the President of Pakistan Ayub Khan, the operation was set in motion. In the first week of August 1965, (some sources put it at 24 July) Pakistani troops who were members of Azad Kashmir Regular Force (Now Azad Kashmir Regiment) began to cross the Cease Fire Line dividing Indian- and Pakistani-held Kashmir across the Pir Panjal Range into Gulmarg, Uri and Baramulla. Several columns were to occupy key heights around the Kashmir valley and encourage a general revolt, which would be followed by direct combat by Pakistani troops. According to Indian sources as many as 30,000 – 40,000 men had crossed the line, while Pakistani sources put it at 5,000 -7,000 only. These troops known as the "Gibraltar Force" were organized and commanded by Major General Akhtar Hussain Malik, GoC 12 Division  The troops were divided into 10 forces (5 companies each). The 10 forces were given different code names, mostly after historically significant Muslim rulers. The operation's name, Gibraltar, itself was chosen for the Islamic connotations. The 8th century Umayyad conquest of Hispania was launched from Gibraltar, a situation not unlike that Pakistan envisaged for Indian Kashmir, i.e. conquest of Kashmir from Operation Gibraltar. The areas chosen were mainly on the de facto Cease Fire line as well as in the populous Kashmir Valley. The plan was multi-pronged. Infiltrators would mingle with the local populace and incite them to rebellion. Meanwhile, guerrilla warfare would commence, destroying bridges, tunnels and highways, harassing enemy communications, logistic installations and headquarters as well as attacking airfields, with a view to create the conditions of an "armed insurrection" in Kashmir — leading to a national uprising against Indian rule. It was assumed that India would neither counter-attack, nor involve itself in another full-scale war, and the capture of Kashmir would rapidly follow. Out of the 9 Infiltrating Forces, only Ghaznavi Force under command Maj Malik Munawar Khan Awan managed to achieve its objective in Mehndar-Rajouri area. 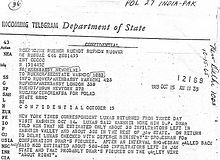 A declassified US State Department telegram that confirms the existence of hundreds of infiltrators in the Indian state of Jammu and Kashmir. While the covert infiltration was a complete failure that ultimately led to the Indo-Pakistani War of 1965, military analysts have differed on whether the plan itself was flawed. Some have held that the plan was well-conceived but was let down by poor execution, but almost all Pakistani and neutral analysts have maintained that the entire operation was "a clumsy attempt" and doomed to collapse. The Pakistani Army's failures started with the supposition that a generally discontented Kashmiri people, given the opportunity provided by the Pakistani advance, would revolt against their Indian rulers, bringing about a swift and decisive surrender of Kashmir. The Kashmiri people, however, did not revolt. Instead, the Indian Army was provided with enough information to learn of Operation Gibraltar and the fact that the Army was battling not insurgents, as they had initially supposed, but Pakistani Army regulars. According to then Chief of the Pakistan Air Force, Air Marshal Nur Khan, there was little coordination amongst the military services on the impending operation. Pakistani author Pervaiz Iqbal Cheema notes that Muhammad Musa, Pakistan's Chief of the Army Staff, was reportedly so confident that the plan would succeed and conflict would be localized to Kashmir that he did not inform the Air Force, as he believed the operation would not require any major air action. Many senior Pakistani military officers and political leaders were unaware of the impending crisis, thus surprising not only India, but also Pakistan itself. Many senior officials also were against the plan, as a failure could lead to an all-out war with India, which many wanted to avoid. ^ Schofield, Victoria. Kashmir in conflict: India, Pakistan and the unending war. I.T. Tauris & Co Ltd, 2003. p. 109. ISBN 1-86064-898-3. ^ Dossani, Rafiq. Prospects for peace in South Asia. Stanford University Press, 2005. ISBN 0-8047-5085-8. ^ Wirsing, Robert. India, Pakistan, and the Kashmir dispute: on regional conflict and its resolution. St. Martins Press, 1998. ISBN 0-312-17562-0. ^ a b c d e Rao, K. V. Krishna (1991). Prepare or perish: a study of national security. Lancer Publishers. p. 123. ISBN 978-81-7212-001-6. ^ a b Ahmad, Mustasad (1997). Living up to heritage: history of the Rajput Regiment 1947-1970. Lancer Publishers. p. 245. ^ a b Singh, Sukhwant. India's Wars Since Independence. p. 416. ^ Karim, Maj Gen Afsir (4 April 1981). "Azad Kashmir Regular Forces". Kashmir-The Troubled Frontiers. ^ Snedden, Christopher (2 January 2012). "Azad Kashmir Regular Force". Kashmir-The Untold Story. ^ Matinuddin, Kamal. "Operation Gibraltar revisited". Opinion archive. The News International Pakistan. Archived from the original on 30 September 2007. Retrieved 8 July 2007. ^ a b Pervaiz Iqbal (2004). The Armed Forces of Pakistan. Allen & Unwin. ISBN 1-86508-119-1. ^ a b Karim, Major General Afsir (retd) (19 September 2005). "The 1965 War: Lessons yet to be learnt". The Rediff Special. Rediff.com India Ltd. Retrieved 8 July 2007. ^ Sehgal, Ikram. "GIBRALTAR-2". Defence Journal (reproduced from The Nation newspaper). Dynavis (Pvt) Ltd. Retrieved 8 July 2007. ^ Faruqui, Ahmad. "Remembering 6th of September 1965". Pakistan Link. Archived from the original on 30 September 2007. Retrieved 8 July 2007. ^ Almeida, Cyril (30 August 2015). "Gibraltar, Grand Slam and war". Dawn. ^ Sawant, VSM, Brigadier Chitranjan (20 July 2015). "Operation Gibraltar". Aryasamaj. ^ Bajwa, Farooq (12 March 2010). "OPERATION GIBRALTAR". From Kutch to Tashkent:The Indo-Pakistan War of 1965. ^ Chadha, Vivek (1 April 2012). "Low Intensity Operations in India". Low Intensity Conflicts in India: An Analysis. ^ "Nur Khan reminisces '65 war". Pakistan's Dawn (newspaper). 6 September 2005. Retrieved 8 July 2006. ^ "Opinion: The Way it was 4: extracts from Brig (retd) ZA Khan's book". Defence Journal. Dynavis (Pvt) Ltd. May 1998. Retrieved 8 July 2007. ^ "Is a Kashmir solution in the offing?". Centre for Aerospace Power Studies. Retrieved 8 July 2007. ^ "Brig (Retd) Saeed Ismat, SJ in a Q&A session ("What do you have to say about 1965 war?")". Defence Journal. November 2001. Retrieved 8 July 2007. ^ Refer to the main article Second Kashmir War for a detailed referenced analysis on the post-war fallout. Operation Gibraltar — An Unmigitated Disaster?